Some hospitals around the world are developing fragrance-free policies and other less toxic practices, but most health-care environments can still be dangerous places to be for people with MCS/ES, presenting enormous challenges if health care services are needed, as I quoted from the ES-MCS Sensitivities Status Report in the post Canadian Statistics on MCS/ES. If a trip to the hospital is required, it’s best to be as prepared as possible. If it’s not an emergency, then your choice of the following documents can be forwarded and discussed in advance. Otherwise, carrying paper copies or discs with us at all times could be warranted, in case of emergency. The following is a list of the best protocols and websites I’ve found, with important resources and documents for people willing and able to take the risks to advocate for themselves or to provide to others so they can do it on our behalf if we are not able. Hopefully you have the time to go through them and choose what is most suitable for you before the need arises. With any luck, you won’t need them, but it’s good to be prepared “just in case”. The following is a template of the health information that needs to be provided to the hospital at the start of consultations with them and prior to hospital admission. This list will need to be refined for each individual. A single page SUMMARY REACTION TABLE (last page of this document) will provide hospital staff with a quick reference of your particular reactants. The list can flag where additional important information is detailed within this document. Environmental health in hospital: A practical guide for hospital staff. Health Care Without Harm is working with hospitals to choose safer cleaning products and less toxic disinfection methods, and to adopt integrated pest management and fragrance-free policies that improve indoor air quality and promote health. 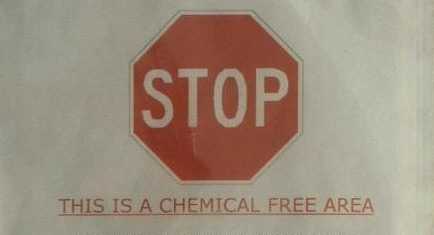 (download the document here: Hospital STOP door SIGN ). Other links from Air Quality and Accessibility in Health Care; Why Aren’t All Health Care Providers Fragrance-Free? Environmental solutions for the healthcare sector and support to create better, safer, greener workplaces and communities. This entry was posted in Environmental Sensitivities, Health Care, Hospital Protocols, Human Rights, Multiple Chemical Sensitivities and tagged health, health care access for people with MCS/ES, health care environments, MCS/ES hospital protocols, medicine. Bookmark the permalink. Personally, I have found that no doctor’s office, clinic, or hospital in Toronto and vicinity is accessible for someone with severe electrical hypersensitivity and the College of Physicians and Surgeons of Ontario is not requiring anyone to accommodate this disability. Therefore, going to obtain life or death services in a crisis could cost one’s life. Fortunately, there are others working in wellness who recognize this extreme peril and fill the gap with their essential services. Accessing alternative wellness practitioners isn’t always an option either, as they too can have harmful habits or be priced out of reach. There are baby steps of hope though, with more places adopting fragrance free policies, as a first step. Health Care Without Harm and I think another org I linked to are working on more healthy environment practices too, but I don’t know if EHS is on their radar or not. Accessing fine wellness practitioners can easily be done from one’s home; many have 10% of their services regularly tithed as a courtesy, especially when the case is someone who would not make it without receiving their TLC. For travelling to receive health services, the Toronto Transit is not accessible due to wireless reporting navigation systems, EMF on the subway from the “third rail” and in above ground vehicles second-hand non-ionizing radiation from other passengers’ cell phones; even Wheel-Trans vehicles that provide door-to-door “accessible transit service for persons with physical disabilities” are not adapted for someone with EHS because their drivers use cell phones for their work and when I last checked this could not be changed. Bicycling on side streets during daylight off-peak times and walking are the safest; when on foot, one can cross the street when seeing another approaching with a cell phone held to the side of the head. BTW, symptoms of radio wave sickness first documented among radar technicians during the Second World War resemble those now associated with electromagnetic hypersensitivity. MCS strategies are more difficult to solve sometimes than EHS solutions. For example, it’s simple to turn off a cell-phone, but to get chemical laundry and personal care products out of clothing, hair and body can take weeks of effort if a person uses them on a regular basis. Clothing can be recontaminated in a dryer that is full of chemical residues and require air drying, but in a home or office environment where incense, essential oils or scented candles are used (some alternative health practitioners seem to think these are atmospheric necessities) the air is no better. Some people don’t have the outdoor space to dry clothing, nor the desire to go to all the trouble of decontaminating themselves. Inviting them into our homes can contaminate our safe space for an extended period of time, or even permanently if proper protection isn’t made, like covering furniture with non-permeable materials to keep 2nd and 3rd hand chemicals from soaking in. Detoxing a space in a hospital or medical environment should be a lot easier to accomplish, and with proper ventilation and filtering techniques, the air can be made tolerable, or oxygen can be provided. And, as one can return home to one’s “safe space” (provided one has found such a medically required space) then a short term visit elsewhere can often be handled. I believe that the National Institute of Building Sciences IEQ Indoor Environmental Quality Project DESIGNATED CLEANER AIR ROOMS does deal with cell phones and EMF issues too. Perhaps that and the AU document from Dr Magda Havas’ site would be the ones to use for those who have EHS as the primary dx? Educating alternative health and wellness practitioners is also required. I have a letter from my PCP based on the one by HEAL AZ or NM, detailing what i need and why. No one follows it. I have printed copies of hospital protocol. No one follows it. Why? MCS is not real. The E/R doctors ask me to take off my mask to make their job faster, no one will give me O2, only paramedics read the letter and comply. In the hospital they wanted a full psych exam so i left. UGH!!! What about their oath to “Do No Harm”??? I wonder if the websites like Health Care Without Harm, Ontario College of Family Physicians Environmental Health Committee, Practice Greenhealth, and The Canadian Coalition for Green Health Care can be used then, since they are all pushing for a healthier environment and describe the problems the general population also experiences from the same things that harm us? “Claudia Miller, M.D., M.S. is a tenured Professor in Environmental and Occupational Medicine and Vice Chair of the Department of Family and Community Medicine of the University of Texas Health Science Center at San Antonio (UTHSCSA). She is also founder and director of the South Texas Environmental Education and Research (STEER) Program, the only medical school curriculum to offer hands-on, experiential training in environmental health, public health, and international health at the US-Mexico border. STEER has been the recipient of national and state awards for excellence in environmental and medical training. The David Thompson Health Region (Red Deer, Alberta area) has developed a protocol for people with MCS who need to stay in hospital. It provides information about the condition and some guidelines to minimize exposures likely to occur in a hospital setting. If you are going to be in the hospital, show this document to your doctor as it will help you to identify your needs. It can be a reference document regardless of which health region your hospital belongs to. All persons who work in, attend as patients of, or visit Kingston General Hospital, have an obligation to help maintain a scent-free environment. Refrain from wearing cologne, perfume, scented personal care products such as body lotions, sprays, and powders, scented deodorant and hair care products, and aftershave lotions (add , laundry products, and essential oils); avoid bringing in scented flowers including but not limited to: Freesias, Lilacs, lavenders, lilies (including day, tiger, Easter Lilies, lily of the valley, and star gazers), Hyacinth and Peonies; refrain from bringing scented air fresheners or personal hand lotions from home. Fragrance –free hand lotions are available at the hospital. Staff will advise all persons entering the hospital about the scent-free policy and educate all persons entering the facility about the health effects of scented products. Patients who are wearing scented products may be asked to wash and/or change their clothing. Visitors who wear scented products will be asked to leave. Security will be involved as needed. Staff who are wearing scented products may be asked to leave the area, wash, and/or change their clothing. Staff who show disregard for the scent-free policy will face appropriate disciplinary action. Suppliers will be notified of our policy and our mandate to purchase scent free products wherever possible. I have found this resource tho I have not done all the things I know I need to do to protect myself should I need to go to hosp… I started looking around and found this. My specific search was mcs and chemotherapy … does anyone know if it is harmful for mcs people to be around a person who is getting chemo? I have seen some people mention that they got sick being around someone who was getting chemo. Some others have not been affected. Thank you Linda for your response. I guess there is not a hard and fast answer and it may depend on when the last chemo treatment was and my level of toxicity at the time of a visit. I did notice in the link I posted above that one hosp requirement for mcs was to be far from chemo treatment.